While the Old Pueblo recorded its 5th wettest October, a town in western Pima County obliterated a record. The climate report card is in for last month, confirming one of the coolest and wettest Octobers in recent memory. Climatology 101: Is this Tucson’s coolest start to October? Sunshine and warmth typically dominate the first half of October. Both have been noticeably absent the last few weeks. Through October 16th, Tucson’s average October temperature is 69.1°. This marks the 16th coolest start to October. It’s also the coolest start to October since 1982, when the average temperature was calculated at 67.0°. Tucson’s coolest start to October on record is 65.6°, set in 1919. All but one day this month has featured daytime highs running below average. The warmest day so far this October was 89° back on the 4th. 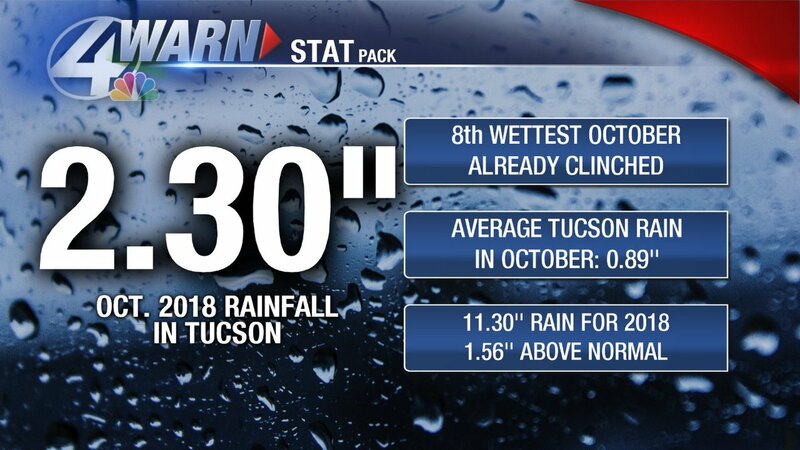 Tucson has already clinched the 8th wettest October on record. 2.30″ rain has been recorded through the first 16 days of the month, which is almost an inch and a half above normal. The wettest October on record for Tucson is 4.98″, set in 2000 and 1983. It wasn’t the best Monsoon. It certainly wasn’t the worst either. Officially, Tucson recorded 7.02″ rain during Monsoon 2018. This marks the 37th wettest Monsoon, running above the historical average rain of 6.08″. 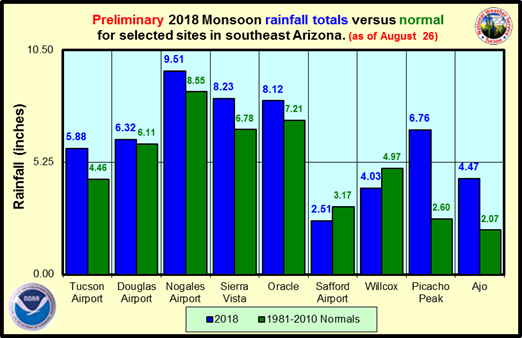 Many National Weather Service observing sites in southern Arizona recorded near or above normal rainfall during Monsoon 2018. However, the University of Arizona’s CLIMAS shows a good chunk of the Sonoran Desert missed out on 25-50% of its typical Monsoon rain. These places include southwest and eastern Pima County and much of Santa Cruz & Cochise Counties. But what about my Monsoon forecast I released in June? In the spirit of transparency, let’s recap how it did. WHAT I SAID IN JUNE: Research shows that the Monsoon high can favor setting up over areas where the drought is prevalent. Where’s the worst drought? Over the Four Corners, a prime position for high pressure to develop storms in southern Arizona. WHAT ACTUALLY HAPPENED: As I also said in June, that research is not a hard and fast rule. In fact, our storms this Monsoon leaned on a few factors: the Monsoon high parking over the Colorado River Valley interacting with moisture from the Gulf of California. This set-up led to much of Metro Phoenix seeing above average Monsoon rain, as storms raced off the Mogollon Rim into The Valley. For Tucson? Some saw lots of rain this summer. Some didn’t. The northwest metro was the big winner (11”+), while Central Tucson, far northern reaches of Marana and the southwest side lagged behind. WHAT I SAID IN JUNE: An early-developing El Niño could lead to Monsoon 2018 finishing with a bang by September. WHAT ACTUALLY HAPPENED: We were oh-so-close to this happening. Sea surface temperatures through the summer have been steadily warming toward a weak El Niño, but never reached the +0.5° threshold. Even though El Niño didn’t make an early arrival, tropical moisture helped keep Monsoon alive through the 30th. WHAT I SAID IN JUNE: Another way the eastern Pacific may influence the Monsoon? A busy hurricane season. WHAT ACTUALLY HAPPENED: This verified, in a big way. Through September, 18 named systems developed in the eastern Pacific Ocean. Many of them did not make landfall, but three boosted the Monsoon. Bud brought widespread rains on June 15th and 16th, a tropical depression supplied steady showers in mid September and more recently, Rosa helped develop scattered storms on the 30th. WHAT I SAID IN JUNE: Drought busting rain? Unlikely. But I think the odds favor the Monsoon putting a good dent in the deficit. I’m expecting 7.05” rain in Tucson this summer. WHAT ACTUALLY HAPPENED: Yes, we’re still in a drought, although it has loosened its grip some. Extreme drought decreased 32% across the state since mid June, while extreme drought dropped 7%. Keep in mind southern Arizona needed over 12” of Monsoon rain to eliminate the drought, which was unlikely to occur. In addition, Tucson ended Monsoon with a yearly rainfall deficit of 0.20”. We entered the summer storm season with a yearly rainfall deficit over one inch. Oh, and about my predicted 7.05” rain for Tucson during Monsoon 2018? I was off. By 0.03”. A Flash Flood Watch continues for western Pima County until Wednesday morning. Remnants of what is now Tropical Storm Rosa move into the state over the next 36 hours. Scattered to widespread showers are expected, especially west of Metro Tucson. While showers are possible this afternoon, the primetime for rain likely arrives tonight. Showers taper off by lunchtime Tuesday. Rainfall for Tucson and areas east will be more beneficial than threatening. 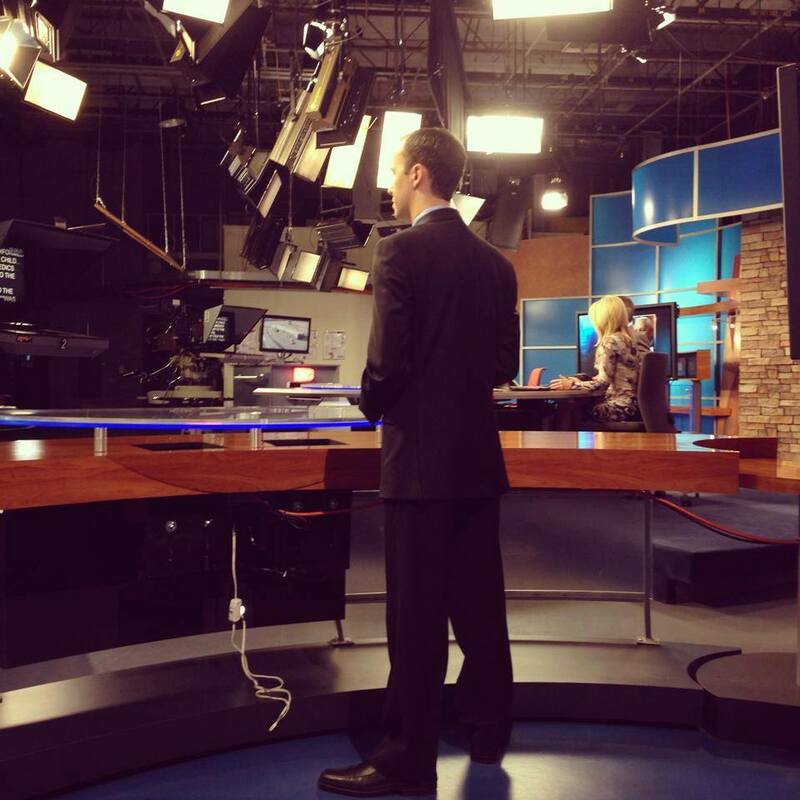 The Old Pueblo could pick up 0.25-0.75″ rain through Tuesday. Heavy rain is possible in western Pima County, northern Pinal County, Yuma County and Maricopa County. Areas along and west of an Ajo-Casa Grande-Globe line could see 1-3″ rain, with isolated higher amounts possible in the mountains. It’s official: the Old Pueblo had a warmer and wetter than normal summer. Tucson’s average temperature of 87.4° marked the 7th warmest summer on record. According to the National Weather Service, this is the 10th straight summer that Tucson has recorded a top 10 warmest ranking. Since June 1st, Tucson recorded 53 days at or above 100°. 3 of these days registered highs at or above 110°. Tucson officially received 5.88″ rain this summer. This ranks as the 31st wettest summer for the city. In addition, this is the third straight year with above average summer rainfall in the Old Pueblo. Rainfall totals across Metro Tucson varied between 3-9″, with some of the largest totals occurring on the northwest side. Through September 3rd, Tucson’s Monsoon 2018 rain total was 6.25″, which is 0.17″ above average. Weather record keeping for autumn officially started on September 1st & will conclude on November 30th. Click here for the complete summer climate recap, compiled by the National Weather Service. With one month to go, portions of southern Arizona has seen above average Monsoon rainfall. As of August 26th, Tucson International Airport has recorded 5.88″ rainfall for Monsoon 2018. This is running over 1.40″ above the normal Monsoon rainfall to date. Tucson is only 0.20″ away from recording its historical average Monsoon rainfall, which is 6.08″. While the city is officially in surplus territory for rainfall, other portions of Metro Tucson are running deficits. 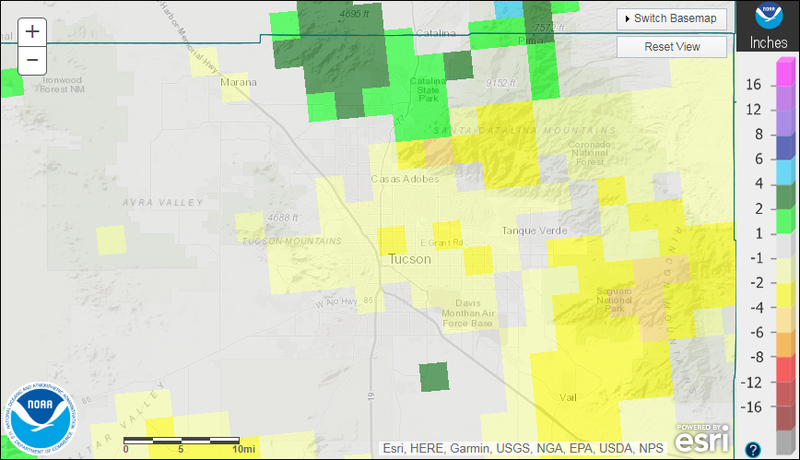 The above map from NOAA shows the driest spots this Monsoon, including Central Tucson, Vail, Corona de Tucson & portions of the Santa Catalina Mountains. These areas are missing 1-3″ rainfall since late June. Most National Weather Service reporting sites in southern Arizona are running above normal for Monsoon rainfall. As of August 26th, Nogales has recorded the most rain with 9.51″. The driest recording site is Safford, where 2.51″ rain has fallen since June 15th. While NWS recording sites are mostly in plus territory for Monsoon rainfall, latest precipitation analysis from the University of Arizona says otherwise. A good chunk of the Sonoran Desert is missing about 25-50% of its Monsoon rain through late August. While Arizona’s summer storm season typically winds down after Labor Day, there is still a good chance for above average September rainfall. According to the Climate Prediction Center, the state stands a 40% chance of above normal rain in September. This is thanks in part to a developing El Niño & potential for increased tropical activity in the eastern Pacific Ocean.